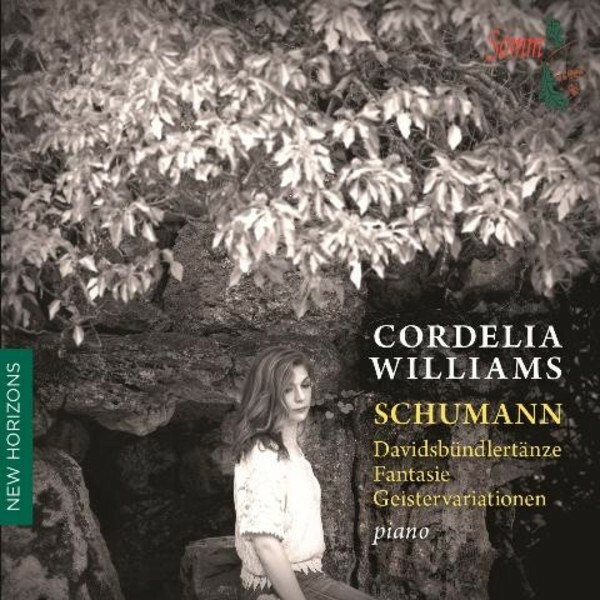 This new recording by the supremely gifted Cordelia Williams (Piano Winner, BBC Young Musician 2006) is a unique coupling of three of Schumann's finest works for the instrument: the Davidsb�ndlert�nze Books I and II, Fantasie and the Geistervariationen. The Davidsb�ndlert�nze ('Dances of the Members of the League of David') is a set of 18 pieces - the 'League of David' who did not really exist, except in Schumann's musical imagination. His wife Clara was practically his sole motivation for writing this work, an expression of his passionate love, longings and dreams. It remains one of Schumann's greatest achievements. His rhapsodic and passionate Fantasie Op.17 was composed in 1836 and dedicated to Liszt - a big challenge to the pianist, but one which Cordelia meets with evident ease and great enjoyment. The Geistervariationen lies at the other end of Schumann's life - in fact, his very last solo piano piece, completed in 1854 just before he was admitted to a mental institution. The 'Ghost Variations' are very rarely heard (Schumann said the theme was given to him by an angel), and constitute a hauntingly beautiful work.